It’s been a decade since Laurent Cantet won the Palme d’Or at Cannes for The Class, and his latest film The Workshop sees him returning to somewhat similar territory. Taking place over a summer in the south of France, The Workshop follows novelist Olivia (Marina Foïs) overseeing a writing workshop where teenagers collaborate on a novel. 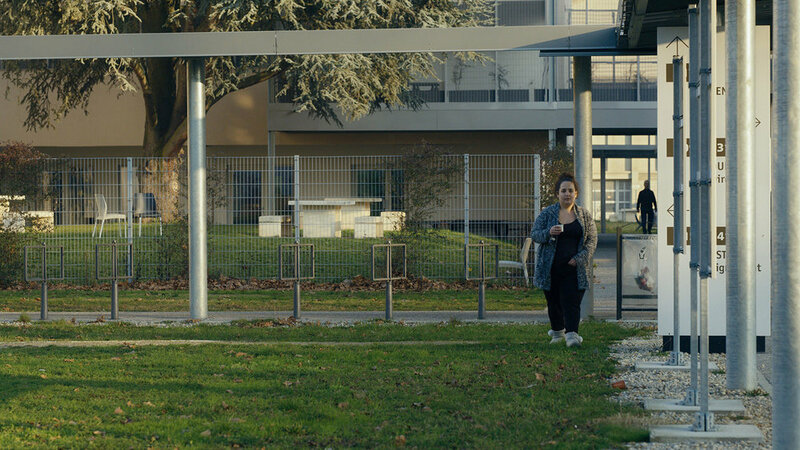 The students decide to write a thriller, and as the development process continues Olivia takes an interest in Antoine (Matthieu Lucci), a member of the group who constantly provokes through his writing and bigoted remarks. The first half follows the development process, which involves Olivia and her students sitting around talking about storytelling and how to approach writing their novel. Cantet co-wrote the screenplay with BPM director Robin Campillo, and much of the compelling approach to group discussions from both Campillo’s film and The Class show up here as well. Cantet, using improvisation and intensive preparation with his actors, creates a sense of urgency to these conversations, as we can feel a real sense of passion from these characters as they try to deal with some of the bigger questions that come with undertaking their project. Cantet and Campillo’s previous films show how adept they are at making conversations crackle, so it comes as no surprise that these scenes make up the best parts of The Workshop. It’s in the second half, where Cantet hones in on Antoine to make a broader statement about contemporary politics, that the film fumbles. It’s laid out in plain terms that Antoine’s lashing out comes more from a place of isolation and boredom than anything else, but as Cantet’s intentions become clearer the film’s specificity suffers. Antoine becomes less of a unique individual and more of a representation of disaffected youth in the Trump/Le Pen era, and the involvement of alt-right ideas and other current references feel shoehorned in compared to the naturalism of everything else. By the final act, The Workshop turns itself into a thriller, a twist that the film thinks is far more clever than it actually is (now they’re living the situation they’ve been talking about the whole time!). And much like its handling of Antoine, the leaning on genre elements hurts the specificity of the drama already established. The film feels like it’s building up to a bang, only to end with a bit of a whimper. Still, some credit is due to Cantet for making a go at a more relevant film. There’s something nice about watching a film that can command so much attention out of seven characters just talking about how to build a story. Cantet has a knack for making lively dramas out of what seems like very little, an achievement that already helped him receive one of cinema’s highest awards, and further reason why he continues making work that’s worth seeing. Give credit where it’s due: Bruno Dumont’s Jeannette: The Childhood of Joan of Arc is visionary, and further proof that Dumont operates on a level his contemporaries aren’t bothered to go towards. After making his name on the festival circuit as an enfant terrible, Dumont changed gears with the hilarious and successful miniseries Li’l Quinquin. He followed that up with the bleak comedy Slack Bay, which saw him zigging when others expected him to zag. Despite recruiting some of French cinema’s biggest names and shooting a gorgeously styled period piece, Slack Bay was a hideous film: its humour ranged from slapstick to juvenile, its professional actors gave unhinged, garish performances, and Dumont once again confronted some of the ugliest aspects of human nature. The film was a massive middle finger to the arthouse audiences and institutions who have praised and dismissed his work in the past, and people either rejected it outright or (like me) embraced its spiteful, absurd nature. Now, Dumont is back with a film that looks like a series of bad choices. It’s about Joan of Arc, but it covers her early years before she even went on to battle; it’s a musical, but it only uses direct sound; and the music itself is a combination of heavy metal, dubstep, electro, and other anachronistic genres, courtesy of musician Igorrr. It’s easy to think that Dumont’s choices won’t work, but Dumont is aware that his decisions are more unconventional than outright bad. So Dumont does what he wants to do, and Jeannette acts as another middle finger, this time towards our perceptions of what constitutes a musical, a biopic, a period piece, and what constitutes “good” cinema. Those willing to give Jeannette a chance have no choice but to abandon their preconceived notions, and anyone who does will find themselves encountering one of the most entertaining experiences of the year. Split into two parts, Jeannette starts with the 8-year-old Joan (Lise Leplat Prudhomme) in 1425, wandering around a field with a friend expressing dismay at the brutality of the English towards the French. She’s having a crisis of faith, dancing and singing her issues out before meeting with the nun Gervaise (Aline & Elise Charles), who appears as twins and tries to convince Joan to not lose hope in God. This sequence, an elaborate song and dance that runs well over ten minutes long, is a marvel to behold. Igorrr’s score bounces from one style to another, the two Gervaises ping pong lines of dialogue and song between each other while performing elaborate choreography, and it all culminates with a headbanging session that would be considered sacreligious if it weren’t so baffling and funny. The film doesn’t reach the high of the Gervaise sequence again, but it remains a riotous act of rebellion throughout. At a certain point the film moves forward four years, and the now adolescent Joan (Jeanne Voisin) finally makes good on her promise to leave home and save her country, thanks to the help of her rapping, dabbing uncle (don’t worry, just go with it). For Dumont, a figure like Joan of Arc is a perfect target for his new style of confrontation. By taking an established historical figure—one that’s been adapted into cinematic form plenty of times over the decades—and building an anachronistic musical around her, Dumont exposes the absurdity of our self-imposed standards when it comes to rendering our perception of truth through history. Jeannette is the party the kids throw when their parents are away, a freeing act of defiance against cinematic boundaries that have been established and embedded since its creation. Dumont is a filmmaker learning from the past in order to move forward at his own, singular pace, and where he leads I will follow. Since 2013, the law in France says that anyone admitted to a psychiatric hospital against their will must have a hearing before a judge within 12 days to determine if their stay should be extended. Raymond Depardon received permission to attend and film these hearings at a facility in Lyon for 12 Days, which showcases ten different people awaiting judgment as to whether or not they’ll be given freedom or a prolonged stay. With only some brief glimpses of the outside world in between hearings as an exception, Depardon keeps things within the hearing room itself and relies on a simple setup for each subject: a wide shot of the room, and a shot reverse shot structure between patient and judge as they discuss the case. 12 Days makes for compelling viewing at first, but as time goes on it becomes apparent that Depardon has no interest in anything but observing this particular institution operating as it’s supposed to. The subject matter and distanced approach to filming recalls Frederick Wiseman’s work, but Wiseman uses editing and form to gradually build a thesis out of his footage. Depardon doesn’t really have a point to make here, preferring to dwell on the tension of each case’s proceedings, which can only sustain the film for so long. Depardon’s film generates questions about the trial system itself, the procedure, and how effective this particular institution’s methods may be in treating mental health, but they’re never entertained. 12 Days exists within one very specific context to look at issues that demand a bigger scope, and while the film is technically accomplished, by the end of its brief runtime it leaves a lot to be desired.